Congratulations to our winner, Sandy, selected randomly via random.org (1-22>17). Do you have a math and science whiz on your hands? Does your little one dream about space? Is the term goofball used a lot at your house? Does your kid dig a cool jive? I might have to recommend Recess Monkey's "The Final Funktier" to them. Katie loves getting new music as much as I do and was thrilled to listen to "The Final Funktier" as soon as we received our preview copy. Unfortunately, we didn't get to listen to the whole CD for quite a while - because she loved the first song so much that she played it over and over again for several dance sessions. Finally, I popped it into the car CD player and we giggled and bopped our way through the entire CD. 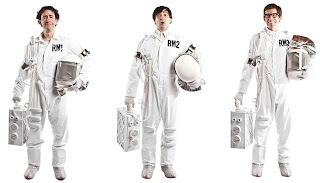 Since this was our first experience hearing Recess Monkey, I'm not sure if the band 'o teachers' various CD's have a similar sound or the space age sound quality was especially produced for this science and space themed project. But it was cool. To quote my 5yo. Personally, I thought it was funky. Hmm, music derived to suit title or title just particularly harmonious? After we listened to it the entire car ride to our friends' house, Katie was eager to share the music with her friend on the next leg of our trip. Recess Monkey will be performing in the Philly area on July 18th. Part of the WXPN XPoNential Festival, on the Camden Waterfront, Recess Monkey will perform at 3pm. (After our good friend Joanie Leeds). I am extremely bummed that I won't be able to attend the festival, but I am thrilled to be able to offer a reader their own copy of "The Final Funktier." This giveaway will close on July 9, 2010. Sounds like something both my boys would enjoy. Sounds cute! If my girls end up being too old, I could give it to my niece or nephew! Sounds pretty cool... I'm sure my kiddos would love it, as they love to dance to all kinds of music. I would love a chance to win. This sounds right up my 5 year old's alley! Thanks! My kids love singing in the car to fun CD's! This would be a good addition!